And now for today’s prompt! The number 13 is often considered unlucky, so today I’d like to challenge you to beat the bad luck away with a poem inspired by fortune cookies. You could write a poem made up entirely of statements that predict the future (“You will meet a handsome stranger”), aphoristic statements (“The secret to getting ahead is getting started)” or just silly questions (“How much deeper would the ocean be without sponges?”) Or you could use a phrase you’ve actually received in a real fortune cookie as a title or first line. However you proceed, I hope you will feel fortunate in the results. The only time I’ve had a fortune cookie was at a Chinese-themed day we organised for the pupils at my school a few months before I retired. The message said ‘you are almost there’ and was just right for me! I could feel myself eager to reach the finishing post and see what lay beyond. 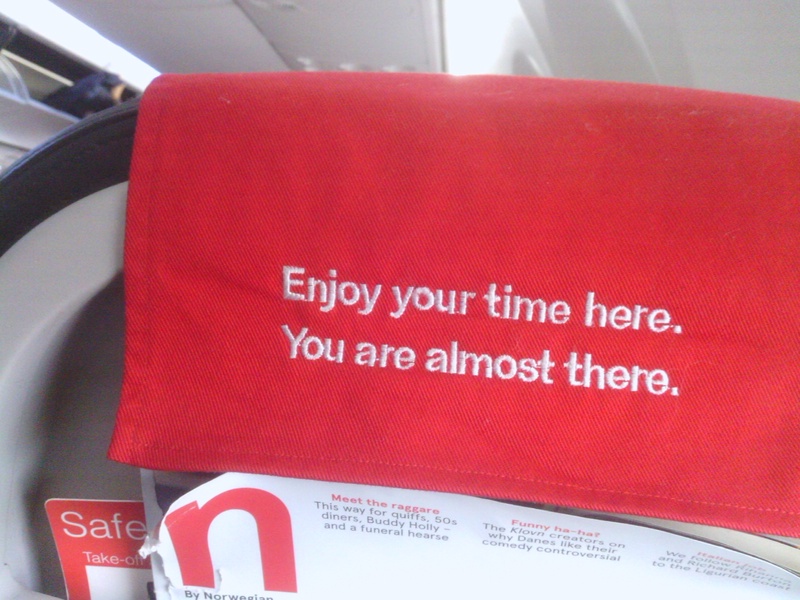 But then I thought of a photo I’d once taken on Norwegian Airlines which is all about enjoying that moment between two states. I’ve always wanted to use that photo – the headrest back was a poem in itself!